When writer/producer Ronald D. Moore won a 2006 award in Los Angeles for his work on the 'reimagined' Battlestar Galactica, host and noted science fiction critic Harlan Ellison congratulated him for taking the 'worst SF TV show' of all time and turning it into the best. Perhaps hyperbolic - there's far worse shows out there than the 1978 iteration of Battlestar Galactica - but an increasingly common sentiment that has seen publications such as Time Magazine, Rolling Stone and the New Yorker declare the new BSG to be the best thing on television, in any genre. Most of these comments stem from the excellent first and second seasons. Rolling back to the mini-series, it is a surprise to see how fully-formed this show leapt onto the screen. Ususally there is a long 'breaking-in' period that has to elapse before writers and actors really start to feel comfortable on their show. Here, however, the characters appear fully fleshed-out from the start, with Edward James Olmos and Mary McDonnell turning in sterling performances from the start, with James Callis also particularly worthy of mention. 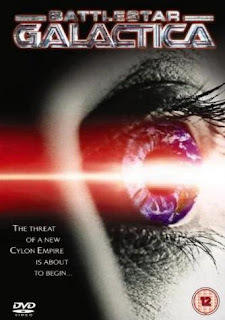 The plot is straightforward: the Twelve Colonies of Mankind are destroyed in a nuclear holocaust unleashed by the Cylons, killing machines humanity created fifty years earlier which rebelled and disappeared into deep space. 50,000 survivors flee to reach the safety offered by the last major warship to survive the attack, the battlestar Galactica, along the way generating plenty of conflict between the democratic, civilian viewpoint (espoused by McDonnell's President Roslin) and the military, pragmatic one (personified by Olmos' Commander Adama). A feeling of paranoia creeps in once it is confirmed that some Cylons now resemble humans and have infiltrated the colonists for their own ends. At three hours long, the pacing in the mini-series is well-handled, although a couple of scenes near the end feel a bit superfluous. There is a lot of story to handle here and a lot of characters to introduce, however, and this fills the time admirably. The 'naturalistic' shooting is a success and the effects are superb, rivalling or exceeding most of their big-screen counterparts, although the jumpy camera work takes a while to adjust to. There is little wrong with the mini-series. Perhaps some scenes are not explained well (a brutal murder near the start of the story is supposedly self-justified as a mercy killing by a Cylon agent aware of the imminent nuclear holocaust, but this excuse, feeble though it is, is never even voiced in the episode) and there are a few wince-inducing lines, but the uniformly good acting and writing more than make up for this. The semi-cliffhanger ending also leaves you eager to pick up the Season 1 DVD box set. Overall, an impressive and enjoyable work. The Battlestar Galactica mini-series (****) is available on DVD very cheaply in the UK. In the USA, it is included on the Season 1 DVD box set. Nice summery. As a member of Battle Star Fans for Obama, I hope your article will get some folks "hooked".